Notch might not have finished his second intended opus, 0x10c, but it was far enough along for us to identify the common threads in his games: home, the frontier, and a love of coding. Budding computer scientists long ago recognised that last part in Minecraft’s redstone circuits. Here’s their latest achievement: a functional hard drive, built without recourse to Minecraft mods. 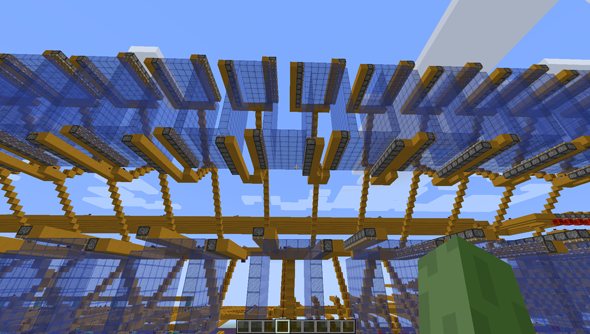 The hard drive is made possible by the fact that redstone signals can pass through solid blocks, but not clear glass blocks. Using pistons to displace one block type for the other, players can transmit binary information – the fundamental ones and zeros used to store binary code on a computer. The hard drive’s creator, a Computer Science PhD student who goes by smellystring, uses solid blocks to store a one and clear blocks to store a zero. With plenty of pistons, it’s been possible to push the blocks around in a mammoth loop. The map includes a control room, where smellystring can issue commands to the drive. A set of lights indicate whether the machine is busy or ready for a new command. The drive is capable of retrieving data by detecting whether blocks are solid or clear, and of writing data by switching out solid blocks with clear ones, or vice versa. But it all comes at a cost. “With only 1KB going on my 8 core 4 GHz gaming desktop my framerate starts to significantly drop,” smellystring told Reddit. What’s the most intimidating computing wonder you’ve come across in Minecraft?